Several years ago I was given a book called Peace, Love, & Barbecue: Recipes, Secrets, Tall Tales, and Outright Lies from the Legends of Barbecue by Mike (and Amy) Mills. Mike Mills owns several restaurants, grew up around real barbecue, and has won many barbecue championships. I just recently started making things from this book, and let me tell ya, everything has been fabulous! 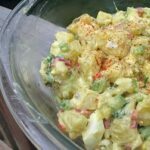 Take this beautiful potato salad as just one example. In the book, Mike travels around meeting with many other barbecue greats and managed to glean a few recipes along the way. 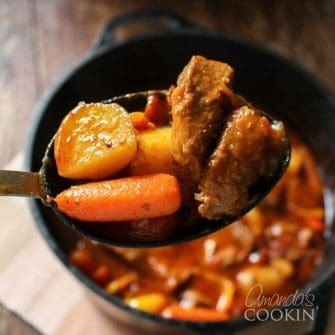 This particular recipe is courtesy of Blair, wife to John T. Edge from Mississippi. 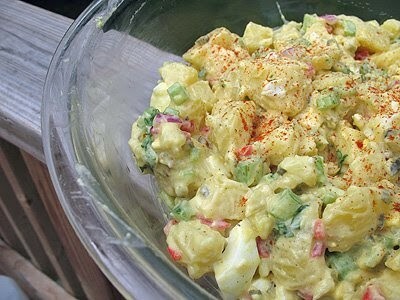 Well Blair, so far in my book, it is the best potato salad in the whole wide world! The colors alone make for an impressive presentation, but the flavor of this dish is wonderful and I can’t wait to make it again! Boil the potatoes, skin on, for about 20 minutes or until a sharp knife easily pierces them. Drain the potatoes and peel them with your fingers under running water (as if you were peeling a hard-coked egg). Put the potatoes and eggs into a chilled bowl, then chop. Add the other ingredients except the paprika garnish. Don’t stir, Dive in with your hands, mashing some of the potatoes to bond the intact golden chunks. Taste it for salt and shape into a pretty mound with a spoon or spatula. Dust the top with the smoked paprika. Cover with plastic wrap and chill. Serve cold. we’re having a family reunion about how many servings is this recipe. Hi Shirley, it makes approximately 15 servings. This looks like an awesome salad and that looks like a pretty cool book. HALLELUJAAAAAAAAAH… I love posts with a food connect and with a tale to tell. 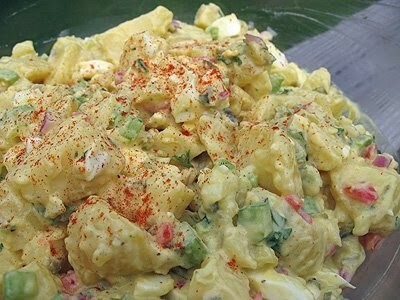 makes food have so much more meaning Amanda, especially to this potato salad. Delicious! vlaizure – So glad to hear that, thank you! Hi I'm really enjoying your blog. I'm adding this to my "to-do" list because I'm salivating just looking at it. What brand of sweet pickles did you use for this recipe.